Reports by Ian Cole, Neil Wilson and Steven Downes. England women’s cricket team stole the show at the 61st SJA British Sports Awards after topping the members’ poll to decide our Team of the Year. Captain Charlotte Edwards led her all-conquering team on to the stage at The Brewery to collect the trophy after a year in which they regained their version of the Ashes and won the World Cup and World Twenty20. England’s men, who regained the Ashes from Australia, had to be content with second place in the poll. Heptathlon world champion Jessica Ennis was runaway winner of the Sportswoman of the Year title ahead of gymnast Beth Tweddle, with cricketer Claire Taylor third, while Formula One world champion Jenson Button topped the poll for Sportsman of the Year, beating England cricket captain Andrew Strauss into second place. The Team award for Edwards’ squad was recognition for a dedicated group of cricketers who have conquered the world over the past two years. In addition England had, in Claire Taylor, the Player of the Series in both the World Cup and World Twenty20 – performances which gave her the honour of being the first woman to feature in Wisden’s Five Cricketers of the Year. The SJA Team of the Year Award capped off another tremendous couple of days for English women’s cricket: the previous evening, at the UK Coaching Awards, Mark Lane, the women’s team’s coach, was named coach of the year and picked up the high performance coach of the year prize. A women’s team – the world record-setting Great Britain 4×800 metres quartet which included Lillian Board – won the SJA’s Team of the Year prize when it was introduced 39 years earlier, but the 2009 England cricketers are the first women’s team to lift the award since their World Cup-winning predecessors in 1993. The England women’s team 2009 journey was only marginally less “unbelievable” to that of Button, the second F1 driver to win the SJA’s Sportsman of the Year award in three years. Exactly one year before Button collected our coveted trophy, the 29-year-old was facing oblivion from the sport he had graced for a decade. Yet after some masterful team management by Ross Brawn, 10 months, and six Grand Prix wins in seven races later, Button was in overdrive on his way to the world title. The winner of the SJA’s Sportswoman of the Year award had also undergone a transformational year in 2009, Jess Ennis winning her first world title less than 12 months after she had missed the Beijing Olympics with a career-threatening injury. 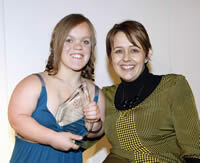 Among the other awards presented, the Bill McGowran Trophy for the disabled sports personality – the longest established of its kind, first awarded in 1963 – was shared by swimmer Eleanor Simmonds and yachtswoman Hilary Lister. This year Simmonds added three European titles and a world short-course title to the Olympic gold she won in Beijing, while Lister became the first disabled woman to sail around Britain. 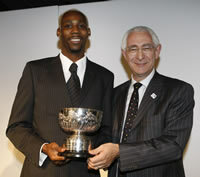 The award for an outstanding performance was presented by the chairman of the FA, Lord Triesman, to Berlin triple jump winner Phillips Idowu. Sporting a bleached silver hairdo and immaculate pin-stripe suit, Phillips looked like he had wandered from his City desk into the Brewery by mistake. The screens showed Phillips’s world championship winning triple jump but only when master-of-ceremonies Jim Rosenthal mentioned the Beijing Olympics did the smile drop – just for a second or two. It is well documented that Phillips berated himself for taking only silver in Beijing but bounced back to win the world title in Berlin in August, the only British male gold medal of those championships. He said: “I’ve been doing this for a long time and I see this award as recognition for a lot of hard work. But I’m not finished yet. My Berlin personal best was a long time coming. The previous one was years ago.There’s a long way to go to 2012 but I’m not hiding from anyone,” he threatened. The trophy for the outstanding contribution to British sport off the field of play was presented jointly to Phil Kimberley and David Faulkner for their work in steering England’s hockey men to a stunning victory over Germany in the final of the European Championship. At the end of the year forward Ashley Jackson, 22, was named World Young Hockey Player of the Year, the first Briton to receive an IHF award. 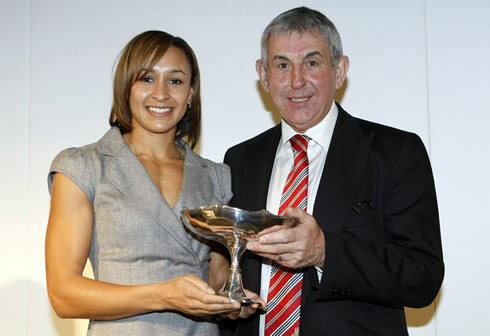 Collecting the award on behalf of their sport, Faulkner, a 1988 Olympic gold medalist, gave credit to Kimberley for “dragging English hockey out of the mire”. 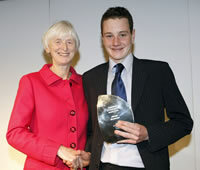 Baroness Sue Campbell, a regular and loyal supporter of the SJA Sports Awards through our sponsors UK Sport, gave their award to world triathlon champion Alistair Brownlee, who dominated his sport in 2009, winning five races in the world championship series, including the final. The Committee Award went to British Gymnastics, recognising not only the impressive staging of the world championships at the O2 Arena, a 2012 Olympic venue, but also the progress made by a sport which is now established as a medal-winning force on the world stage. Sir Michael Parkinson’s SJA President’s Award went to showjumper Ellen Whitaker. Of all the punters seated around the tables in the Porter Tun Room, many would admit to enjoying the occasional flutter. Not so modern pentathlete Heather Fell, winner of sponsor Sky Bet’s £500 free bet. Proceeds from the bet go to a charity of her choice but despite some mouthwatering odds from Sky Bet’s Tim Reynolds, the lady would not be rushed. Some of the tempting prices: England to win the 2010 Football World Cup (11-2); Andy Murray to win Wimbledon in 2010 (10-1); England to win the Six Nations rugby tournament (10-1). *UK Sport is the longest standing lead sponsor of the Sports Journalists’ Association, with a partnership that goes back more than a decade. Sky Bet are the SJA’s newest partners, the sponsorship being announced in October 2008. The SJA Annual Sports Awards are the longest established of their kind in the United Kingdom, having been first staged in 1949. Runners-up: England men’s cricket and Brawn F1 motor racing.